We’ve been trying out the Roomie Remote app for a while now, comparing it to our dedicated home cinema remote control. Roomie goes way beyond the normal single room management of even the best dedicated universal remotes and more and more home devices now offer IP control which Roomie can discover and configure automatically. The brand new version 2.0 of Roomie has just been released and it adds support for Indigo v6 home automation software, Kaleidescape Movie Servers, Belkin WeMo Switches plus the latest Sony TVs and LG Blu-ray players. That’s on top of the already huge list of supported hardware including the Fibaro HC2, LightwaveRF, MiCasaVerde Vera, Philips Hue, Roku, Sonos, Plex, XBMC, iTunes, Airplay / Apple TV and TiVo – to name but a few. V2 also adds gesture control and iOS 7 support and Roomie’s existing 2 way communication brings live control feedback to your screen as well as the ability to embed streaming images from your CCTV cameras too. The basic Roomie app is universal (for iPhone / iPod Touch and iPad), still costs £6.99 and will control 2 IP devices in 1 room. Existing 1.x owners will get a free upgrade to the new version, as is the way of the iTunes App store. 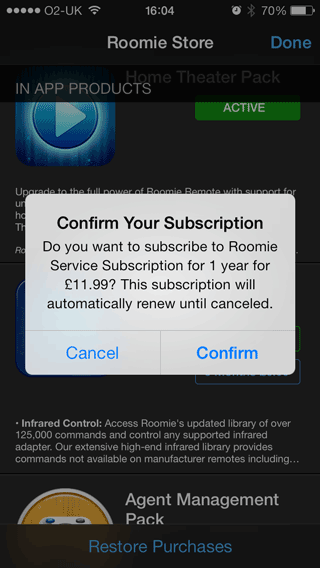 To get the full Roomie experience though you’ll need to make some in-app purchases. The “Home Theater Pack” is £13.99 and adds the ability to create unlimited devices in unlimited rooms. The “Agent Management Pack” is £6.99 and enables control of an OS X computer (if you need it) including app launching, screen viewing and mouse control as well as providing local syncing and backups – more on that later. Roomie also offers a path to control infrared devices. It has a library of tens of thousands of IR commands and integrates nicely with the excellent range of TCP/IP to IR hardware from Global Cache, like the Ethernet IP2IR iTach pictured above (now available in the UK from globalcache.co.uk) which is also available in a WF2IR Wi-Fi version too. You can check Roomies Supported Devices list and the Global Cache IR add-ons have a learning capability if your device isn’t listed. The infrared control pack is by far the largest ongoing expense post-sale. We update 10,000 to 30,000 codes each quarter and all of that code work is updated from us live as a service. A user who purchased code library access in 2011 has now had 2 full years of ongoing services updating the codes. That work involves not just bodies but licensing fees and all kinds of red tape. It’s really the most subscription-oriented concept. And that’s something we hadn’t considered. The iTunes store is littered with apps that have died on the vine and we’d much rather Roomie was still around in 5 years time, so who are we to deny it a sustainable business model. Roomie has plenty more tricks up its sleeves. You can turn on the “Override Volume” option and use your iPhone’s volume buttons to control your device. Something as simple as turn your home theatre system volume up and down can be frustrating with a touchscreen as you have to look down for the buttons so this simple option can make things easier. You can also augment the touchscreen experience by enabling some feedback with the Vibrate option turned on. You can even have Roomie pause the playback of your system when you get an incoming call on your iPhone. There’s additional hardware to bridge IP to control serial RS-232 devices too. Some IP devices (like Samsung TVs) won’t “Wake up on LAN” so require either an IR kick start or a HDMI CEC device. Configuring our Pronto TSU9600 required a PC and some fairly complex software so, it’s especially impressive that Cyphersoft have been able to build an app that can be setup completely and independently on the device itself. A Roomie system is built using the three concepts of Rooms, Devices and Activities. 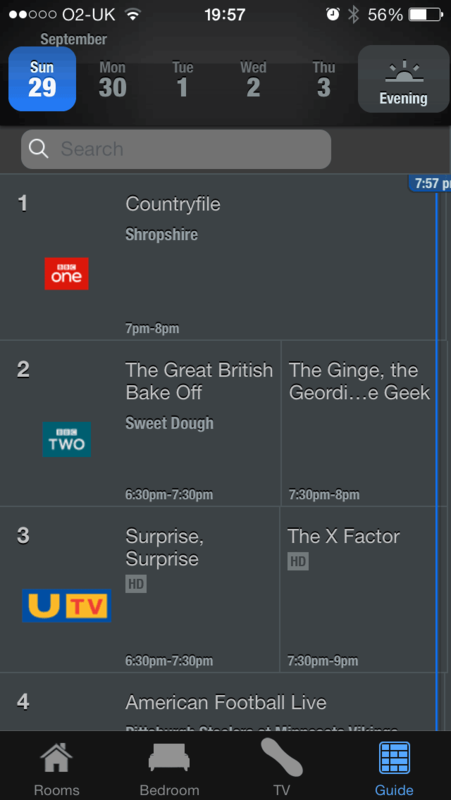 You can select ‘punch through’ volume and power options and different TV Guides can be attached to different rooms so for example you could have a FreeView guide on the bedroom telly but show a Sky guide for your home cinema room. Rather than try to explain here how it all works there’s a great video tutorial (below) that gives an overview of the process. Once your hard work is done there are a few options for backing your Roomie configuration data including email and DropBox. You can set Roomie to poll the DropBox file so you can seamlessly sync your setup changes to the families iDevices. If you are a custom installer / Integrator you could use this facility to push updates to your clients too. You can also sync local devices without DropBox over your Wi-Fi too, which is faster. All in all Roomie is an incredibly fully featured smart home controller for your iPhone or iPad that allows you to manage a vast array of domestic devices and create complex macro sequences. Perhaps most importantly, Roomie is a single app to control all your stuff, rather than the hell of constantly switching between an app for every single device and service. V2 brings new features, fixes and options that will keep Roomie at the top of the pile for some time to come. Check out the links below and watch this video. Be the first to comment on "Roomie Remote: Your iPhone & iPad Smart Home Controller"